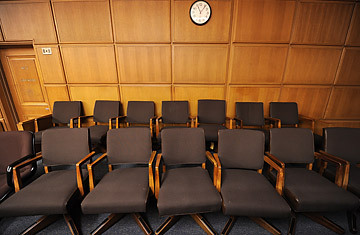 A view of the jury box of a courtroom closed due to budget cuts and layoffs, at the Stanley Mosk Courthouse in downtown Los Angeles, March 16, 2009. Caught in the cross-hairs of California's state budget crisis, the Los Angeles Superior Court  the largest trial court system in the nation  this week laid off 329 employees and closed 16 courtrooms. Facing an unprecedented $79 million shortfall, Presiding Judge Charles W. McCoy said that the courts will lay-off an additional 500 workers and shutter up to a total of 50 courtrooms come September. Announcing the cutbacks in a courtroom closed months ago to save money, McCoy said, "Today is a sad day for justice in Los Angeles." With attrition, McCoy expects the 5,400-employee court system to lose approximately 1,000 employees, a 20% reduction. The 16 closed courtrooms handled criminal, family law, civil law along with complex litigation and small claims case loads. Similar cuts are taking place in courts across the state. McCoy says the 100,000 Angelenos who use the courts each day can expect growing case backlogs, longer lines and delays in processing judgments. Among those losing their jobs: clerks, court reporters and supervisors. Judge Marjorie Steinberg says her family law departments are losing mental health professionals who help parents negotiate their disputes before they go to court: "You can imagine how tough that is on a family, and on the children, whose parents are fighting." The trial system will not be affected uniformly. Statutory and constitutional guarantees in the criminal justice system protect the right to a speedy trial, says Allan Parachini, spokesman for the Los Angeles Superior Court, so "we really can't go to the criminal courts for the cuts... what is happening is that resources are being bled out of other areas, especially civil, to make sure we can meet all our obligations in criminal." Ten years ago the average time to trial in a general civil case in Los Angeles County was an eye popping five years. Reforms and increased efficiency reduced the wait to 16 months but Parachini says he expects civil case delays to spike again. "In addition to the impact on the civil courts, our family and juvenile courts are about to take huge hits," says Don Mike Anthony, president of the Los Angeles County Bar Association. He says custody orders, divorce and child support matters that now take 30 days will soon take four months. In addition, the court will no longer provide financial support and supervising personnel to the Court-Appointed Special Advocates (CASA) program which works on behalf of abused, neglected and abandoned children involved in dependency court matters. Among the mundane cuts, a reduction of the popular night traffic court from twice to once a month. "We have explored every financial scenario before taking this action, but more than 80% of our budget goes to salaries and benefits, which forces today's drastic measures," said McCoy. With annual court budget deficits expected to be as high as $140 million over the next four years, court officials say up to 1,800 staff positions may be eliminated. Last year, the California judicial council instituted a one-day per month closure of all state courts as both a cost-savings. "The unintended yet inevitable symbolism of 'Closed' signs on our courthouses  institutions that embody our nation's revered democratic ideas  is a graphic indication of the severity of California's economic crisis," said California Chief Justice Ronald George addressing the state legislature last year. "For many Californians the courts represent their primary  and sometimes their most important  interaction with state government. Courts are not a luxury to be funded in good times and ignored in bad times." Meanwhile, the negative economic ripple effect of cuts to the Los Angeles civil courts could result in a nearly $30 billion hit to the local economy over the next four years, according to a study commissioned by the Los Angeles Superior Court. According to the study, the legal services industry would take an estimated $13 billion loss and businesses operating in uncertainty, because of pending civil disputes, would accumulate another $15 billion in potential losses. The decline in economic activity would then result in an additional $1.6 billion in losses. See pictures of wildfires in California.